Advances in optical DLS microrheological techniques and development of novel combined DLS-Raman-Microrheology platform, as in the Zetasizer Helix allows the development of insights over the wide length scales/timescales typically encountered in food systems. In addition particle-particle interaction effects and changes in specific chemical markers can be further elucidated. These aspects play a critical role in the overall structuring and self-assembly of food soft matter systems. This novel combined technique has recently been applied to understanding the evolution of self-assembly in a biopolymer (Agarose) and a whey protein (b-lactoglobulin) system, both of which are utilized extensively in the food industry. The following highlights the key insights from both of these studies. Only highlights are presented here as the studies have been detailed in two recent publications (1-2). Agarose Thermo Gelation Agarose is biopolymer which undergoes self-assembly and gelation through a decrease of the temperature. The rheological response can be tuned through the biopolymer concentration and thermal conditioning. In this study this self-assembly process was followed through the Zetasizer Helix by carrying out optical microrheology and Raman spectroscopy measurements. 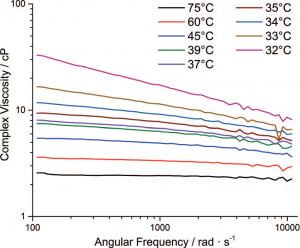 Figure 1 illustrates the evolution of the viscosity with decreasing temperature. The viscosity increase is accompanied by enhancement of shear-thinning indicating enhanced structuring with decrease in temperature. 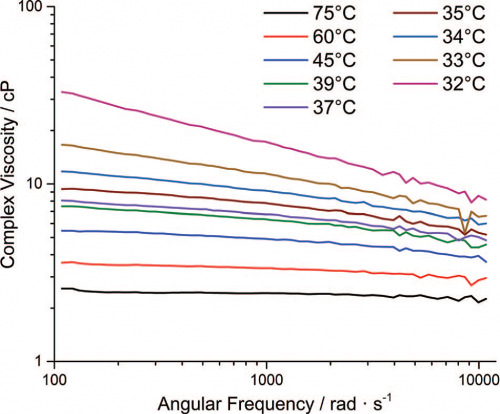 Raman measurements showed an increase of the low frequency band (170 cm-1) with a corresponding decrease in the temperature. As seen in Figure 2, the increase in the low frequency Raman band and the evolution of the elastic modulus, G’ exhibits a very strong correlation. According to the currently accepted understanding of agarose gelation, there is an initial change toward a helical structure which then starts clustering together to eventually form a percolated network. Our observations from the Raman data suggest that water exhibits increased correlated motions as it incorporates into this helical structure and becomes increasingly confined. This increase in water structuring is therefore well aligned with increased network formation giving rise to an increase in G’. β-Lactoglobulin:Colloidal Stability & Conformational Changes: β-lactoglobulin is a whey protein utilized extensively in the food industry. 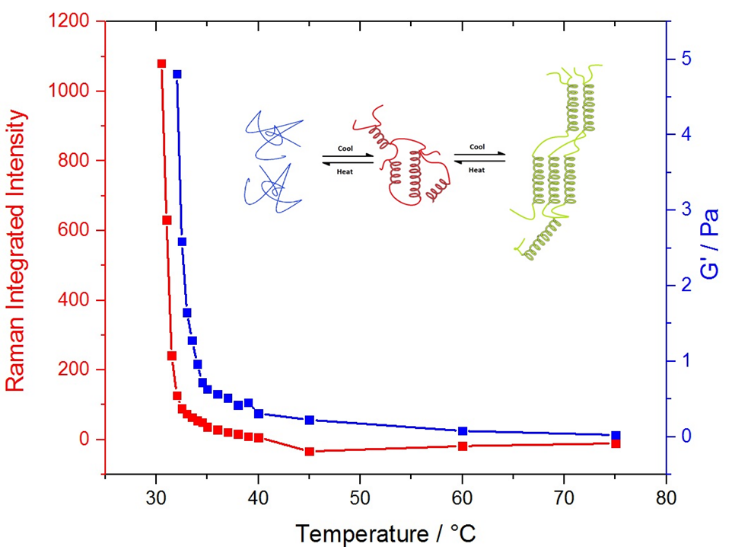 The self-assembly and gelation in this protein can be tuned through thermal conditioning, pH and protein concentration. The necessity for detailed understanding of protein folding and self-assembly has led to numerous studies on a wide range of proteins. However developing a comprehensive understanding between colloidal and conformational dynamics in proteins has been challenging because the thermodynamic pathways that drive them, such as unfolding and aggregation, can occur simultaneously and, thereby, in a convoluted manner. Part of this challenge arises from the inability of analytical instruments to effectively tease apart and distinguish these convoluted unfolding and aggregation pathways. In this study a detailed concomitant dynamic light scattering (DLS), DLS microrheology, and Raman spectroscopy thermal aggregation study on a protein was carried out at a number of different pHs to explore the effects on both colloidal and conformational stability and associated rheological changes. Furthermore, in addition to Raman spectroscopy, differential scanning calorimetry (DSC) studies were carried out to explore the unfolding processes. Figure 3: Graph depicting changes in the A) elastic modulus, G’ as a function of pH and temperature and B) Correlation of G’ with changes in the principal component analysis (PCA) score derived from the low frequency (intermolecular) Raman spectral interval (200–400 cm−1). 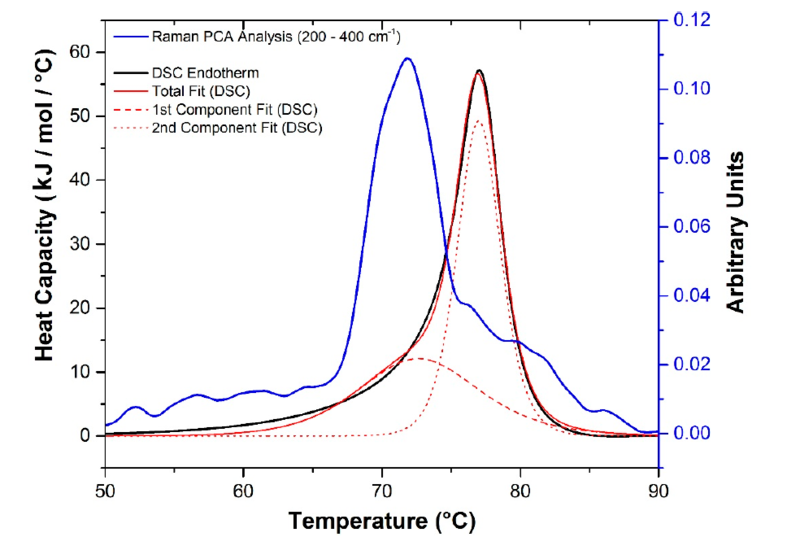 Figure 3 above illustrates the strong correlation between the evolution of the elastic modulus and the changes in the PCA score derived from the low frequency (intermolecular) Raman spectral interval. This indicates that this low frequency Raman data is linked to the protein aggregation event. 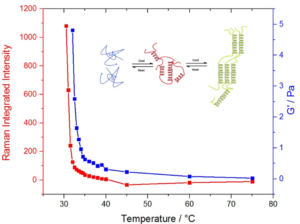 Utilizing this further with the DSC thermogram allows the protein unfolding and aggregation events to be deconvolved as illustrated in figure 4. 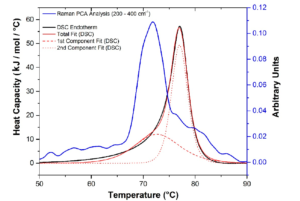 Figure 4: Derivative of the change in the Raman PCA score (200–400 cm−1) versus temperature (blue line), for the sample at pH 5.5, indicative of changes in intermolecular interactions and the DSC endotherm of the sample at pH 5.5 (black line). Double non-2-state fit of the DSC data (red solid, dashed and dotted lines). The low frequency Raman data provides additional new insights into the evolution of self-assembly and rheology in this protein system. In conjunction with DSC this allows further teasing apart of the unfolding and aggregation events. The diffusion interaction parameter, kd, has emerged as a good indicator of colloidal stability in this protein system. The combination of DLS-Raman-Microrheology techniques in conjunction with DSC therefore emerges as a powerful method to derive new insights into colloidal stability, rheological evolution & conformational changes and stability in protein formulations. Blake, S.; Amin, S.; Qi, W.; Majumdar, M.; Lewis, E.N. Colloidal Stability & Conformational Changes in β-Lactoglobulin: Unfolding to Self-Assembly. Int. J. Mol. Sci. 2015, 16, 17719-17733.